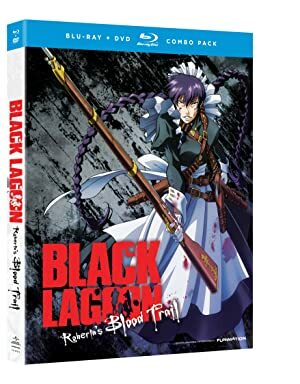 Black Lagoon is a 2002+ manga series, which began receiving its anime adaptation in 2006. It is about a band of modern-days pirates and mercenaries. They are based in Roanapur, a mobs-dominated pisshole of a city in Thailand. 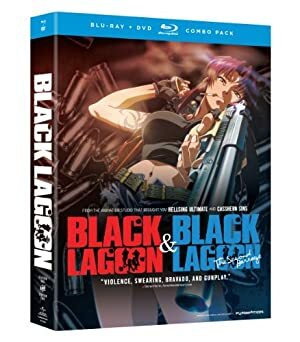 Black Lagoon is steeped into the aesthetics of ultraviolent 1990s and early 2000s action movies and “gun opera” movies, with a dark overall tone. It is a seinen manga, meaning that it is aimed at older and more kanji-literate readers than shōnen manga (aimed at boys). 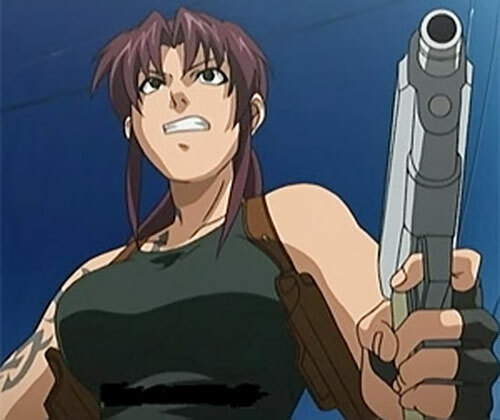 Levy is the lead character of the Black Lagoon story. Real Name: Rebecca (family name unrevealed). Base Of Operations: Roanapur, Thailand (although active throughout southern Asia). Revy’s skill with firearms and ability to dodge bullets seem superhuman. Revy is the one of the deadliest fighters in the series. There are only a few other characters, such as Roberta, that can hold their ground against her in combat. Her weapons of choice are twin modified Beretta 92Fs. They appear to have been hard chromed and fitted with threaded extended barrels (for silencers) with thread protectors. They are engraved with “Sword Cutlass”, the jolly roger of the famous pirate Calico Jack , and an inscription in Thai. The grips are inlaid with Calico Jack’s jolly roger as well. Due to her ambidextrous marksmanship, she is nicknamed “Two-Hands” by the people of Roanapur. A fan-cut “trailer” for the anime. It works fine. 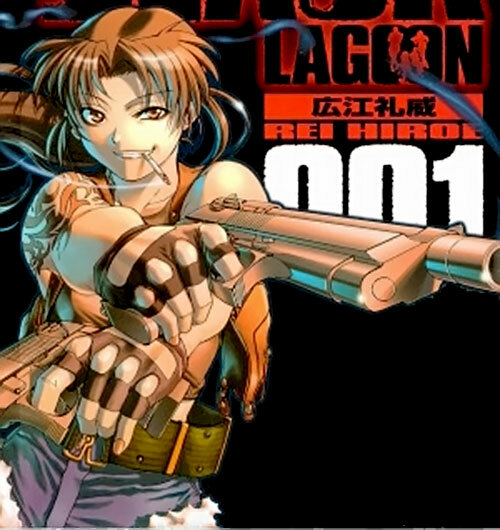 Little is known about Revy before she came to Roanapur and fell in with Dutch’s Black Lagoon Company. It’s likely she grew up in an impoverished family and spent most of her youth involved in one crime or another that gradually became more and more violent. There is some implication that she may have killed her parents. It is highly likely that she got in trouble with the wrong criminal element, or the law, or both and had to flee to Thailand. There is some implication that Mr. Chang may have taught her how to use firearms. Regardless she eventually joined the Black Lagoon Company and acted as the muscle for a company that primarily does smuggling runs. 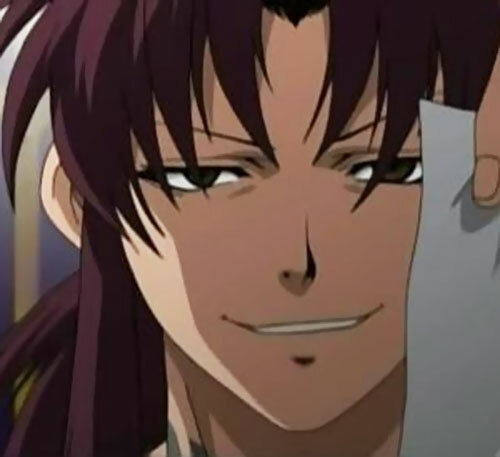 Revy’s life changed when they stole an important disc from the Asahi Industries in order to blackmail them. Along with the disc they kidnapped its courier, who had no idea what was actually on that disc. The Black Lagoon Co., while not the most law abiding people, do have certain principles. They are extremely hospitable to those they have taken prisoner. Thus when Asahi Industries hung the courier, Rock, out to dry he elected to stay with the Black Lagoon Co. rather than go back to his previous life. Since then the group has fought pirates on the high seas and battled a Nazi remnant group over a once thought long lost painting. ut there was always some tension between Revy and Rock mainly because Revy perceived Rock as being weak and unable to take care of himself. Finally one day while running errands the two got into a confrontation at a restaurant. Rock firmly stood his ground and Revy almost shot him, but he managed to grab Revy;s gun a split second before she shot him. Since then the two have worked together well with only some minor friction. They often pair up with Rock acting as the diplomatic brains of the operation and Revy as the muscle. Later kidnapping the heir of a decaying Columbian drug cartel put them into conflict with the family’s maid who was actually a match for Revy ! After that they were hired by Mr. Chang to deliver some documents to the UN dodging terrorist all the way. Despite her misgivings Revy did save Rock when he was captured during this episode. Their next adventure was a bounty hunt for a pair of serial killers loose in their city. Later they helped a skilled counterfeiter escape from the syndicate that wanted her back. Revy and Rock were last seen in Japan helping Hotel Moscow take over Tōkyōfs underworld. Rock acted as Hotel Moscow’s translator and Revy acted as his bodyguard. Revy is a Chinese-American woman who is probably only in her mid-20s. She stands around 5’5” or so. She has a trim but still curvy build that she manages to maintain despite a diet apparently consisting only of alcohol, cigarettes, and take-out pizza. She has dark purplish hair, an intricate “tribal” tattoo on her right shoulder and upper arm, and dresses in unlaced combat boots, partially undone Daisy Dukes held in place by a military web-belt, a short black tank-top, and a two-gun shoulder holster that contains her customized twin 9mm “Sword Cutlass” Beretta 92F automatic pistols. While in Japan she wore a black sweater with a red pleated miniskirt with black tights, sneakers, a light brown parka and a dark red stocking hat along with the same black leather fingerless gloves. Revy is very competitive, easily bored, and quick to anger. While being extremely attractive, she also has many personality traits that some would see as highly undesirable. Unlike Rock, she is undiplomatic, believing in the use of brute force and coercion to get her way. 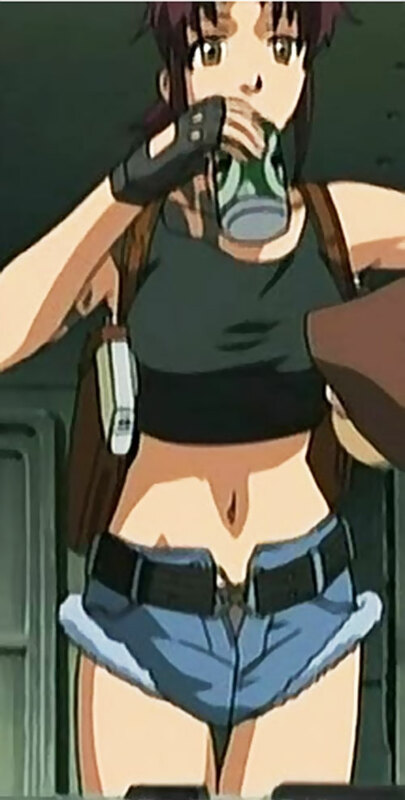 Revy is a killer without a conscience, and she is also a heavy smoker and drinker. Of all the characters in the series, Revy uses the foulest language. She takes maniacal glee in killing anyone and everyone, even children. She nearly shot Rock at point blank range during a confrontation in episode 7. However, she does have a tendency to save Rock from critical situations. Later on she admits to considering Rock as family to Balalaika (to which Balalaika commented she’s become a better speaker). It’s been hinted that she cares for Rock much more than she lets on. She clearly feels barely-contained jealousy whenever Rock finds another woman attractive and appealing. According to CIA agents in the Philippines, Revy is still notorious in the NYPD, particularly at the 27th Precinct. To Revy there are only two things that matter in the world — guns and money. The latter can get you the former, and the former can get you a great deal of the latter. She doesn’t see much use for God, compassion, love for your fellow man, and so on, since virtually none of that was shown to her while she was growing up… so why show it to anyone else? To her, power is all that matters, since power can get you all you need. This is probably why she’s a abrasive as she is. She can’t show weakness to anyone, else they’ll walk all over her. To Revy, diplomacy is simply which gun to best threaten someone with. Revy’s fascination with guns and power means that she is fairly callous and uncaring killer. She often smiles almost maniacally during gunfights. She will kill most anyone and everyone without hesitation, having an almost psychopathic love for gun fighting and violence in general. Dutch comments that whenever Lagoon Couriers gets a new addition, Revy goes on a killing spree, as seen in Episode 6, Moonlit Hunting Grounds, where she tries to kill everyone on board the Nazi ship, including the civilian crew members the Nazis had hired to run the boat. It is possible that Revy has a death wish, hence her desire to get into violent gunfights with the toughest people possible. She certainly drools at the prospect of facing off against Ginji, especially once she saw him cut a bullet out of the air with his sword. It may also be that her getting into, and surviving, violent confrontations simply reinforces her own self image and her right to exist. Basically, if she lives and you dies, then you weren’t strong enough for this world, were you? Roanapur is a very interesting setting that could inserted whole into the DCU since we all know there isn’t all that much going on in Asia. Or the Black Lagoon Co. could reasonably be encountered anywhere in southern Asia. Gritty street action characters would best fit this sort of setting. Bat family members could easily have some memorable adventures with the Black Lagoon Co. or in Roanapur. Again Roanapur or the Black Lagoon Co. could be inserted whole and come into conflict with a variety of characters in the region. Possible characters through into this mix could include the Punisher or Daredevil, but characters with superpowers that frequent these criminal elements such as Wolverine or Deadpool might be too much. Or alternatively the final story arc resulting in a clash between the Russian Mafia and Yakuza could pit the characters against the Hand and affiliated heroes and villains. Empathy is a skilled power (+5 BC) and is minor marginal (-1FC) and only usable on other killers (-2FC). This reflects her ability to communicate with Ginji in the final story arc despite the language barrier. Attractive, Intensive Training, Iron Nerves, Lightning Reflexes, Sharp Eye, Shtick (fast draw, paired firearms, stance assessment). Black Lagoon Company (High), Rock (high), Hotel Moscow (Low), Mr. Changfs Triads High), Church of Violence (particularly Eda) (Low), Chief Watsup (Low). MIA (Rock), Involuntary Exile (USA), MPSI, Serious Rage, Socially Inept. Beretta 92Fs [BODY 04, Projectile weapons: 04, Ammo: 08, R#02]. Her primary weapons that she is almost always never without. She has occasionally used a Generic common melee weapon [BODY 04, EV 03 (04 w/STR, 07 w/Martial Artist), R#02]. Big revolver action grenade launcher [BODY 04, Range: 07, Ammo: 06, R#03] with 6 offensive grenades [BODY 03, EV 07 (Area of effect 1 AP), Grenade drawback, R#03]. Assault rifle [BODY 04, AV 04, Projectile weapons: 06, Ammo 08, R#02, Advantage: Autofire]. Combat shotgun [BODY 04, Projectile weapons: 06 (Diminishing), Range: 03, Ammo: 07, R#03, Advantage: Scattershot, Limitation: Projectile weapons has No Range – use the Range given next instead, Drawback: Very long reload time]. Revy only uses heavier rifles while aboard the Black Lagoon to defend it when theyfre out gunned. In addition Revy could also reasonably have access to almost any form of standard street level weapons and even a few military grade pieces of hardware although this is what she most commonly uses. Characters in Black Lagoon are constantly sizing one another up. Roberta was identified as a powerful opponent through a simple photograph that Balalaika, the Russian Mafia boss, just because she had the eyes of a killer. It would seem that anyone in the BL universe gets the Stance Assessment Schtick for free once they get up to a certain power level. Everyone noteworthy in the universe has it and everyone of those people seem to know just how powerful others are despite very limited info in a lot of cases. It’s also noteworthy that both Ginji and Revy identified each other as killers before they even saw one another fight and this is despite huge cultural and linguistic barriers. Part of that had to do with them having Empathy as a skilled power though. Source of Character: Black Lagoon (animated series). Helper(s): Wikipedia, Sébastien Andrivet (for weapon stats), Surbrook , Adam Fuqua.